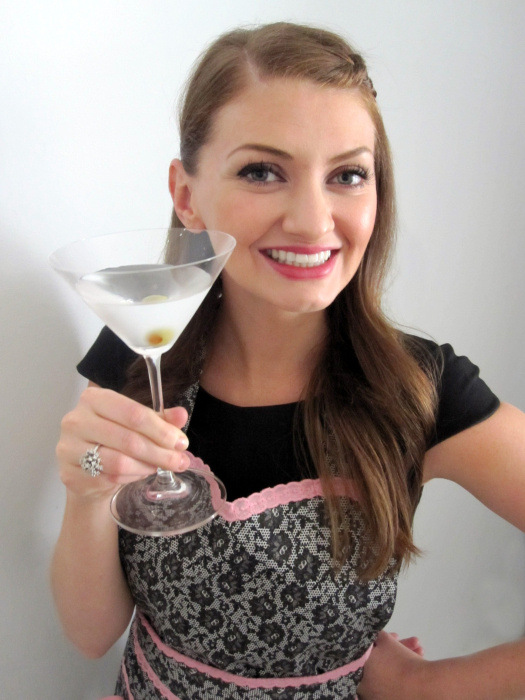 this month, i was assigned K&K Test Kitchen, an adorable blog written by mother-daughter team kim + kelsey. i was so excited, as i had seen their blog in the past + loved it – it’s full of wonderful recipes, beautiful food photography + charming anecdotes. i literally looked through every single post (yep, 2+ years worth) while deciding what to make – their blog is addictive! in the end, i opted for these butterscotch oatmeal cookies, as i absolutely love oatmeal cookies. i decided to add chocolate chips as well, because adding chocolate to any recipe is almost always a good thing, right? thank you to kelsey + kim for introducing me to this fabulous dish, + to the secret recipe club for connecting me with fantastic bloggers + amazing recipes! beat butter, granulated sugar + brown sugar in large bowl until well blended. add eggs + vanilla; beat well. combine flour, baking soda, cinnamon + salt; gradually add to butter mixture, beating until well blended. stir in oats, chocolate chips, + butterscotch chips; mix well. drop by heaping teaspoons onto ungreased cookie sheet. bake 8-10 minutes or until golden brown. cool slightly; remove from cookie sheet to wire rack. cool completely. I love oatmeal cookies and yes, adding chocolate chips is always a good thing in any recipe:-) Your cookies are so puffy and round…I love it!!! With salted caramel ice cream…wow that sounds awesome!!! I think I would have had to pick these cookies too, they sound really delicious and I love your addition of chocolate chips. Mmm, I love me a good cookie recipe! talk about perfectly shaped cookies!!!! Okay, so I might be weird–but I actually prefer oatmeal cookies to any other! And these? These look so.good! 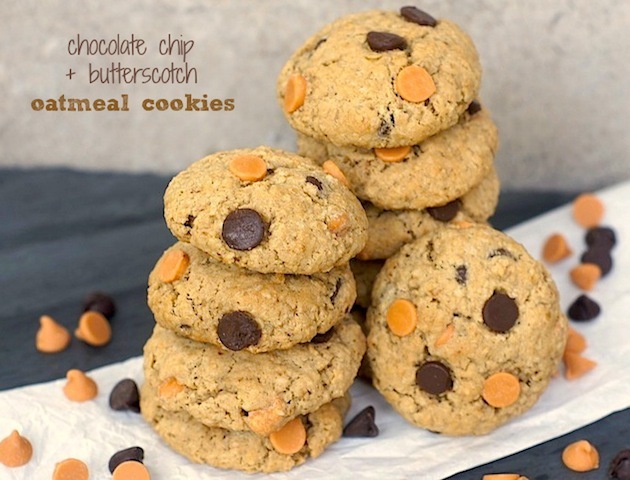 With the chocolate chips and butterscotch chips–total yum! oh, i love this flavor combination, especially in an oatmeal cookie! wow I’m bookmarking this now! I’ve been looking for recipes with butterscotch chips as I still have some left over and this looks like it. Great SRC pick! What a great looking cookie! They look delightfully chewy and full of flavor – and I agree, butterscotch and chocolate are wonderful together. Love oatmeal cookies and these look delicious…of course adding chocolate chips is always a good thing! Great SRC pick! oatmeal cookies, especially with butterscotch, make me think fall. i’m so ready for it…and a good couple of these cookies! i love how much this cookie has stuffed in it! the chocolate chips and butterscotch! oh the flavors and delicious oatmeal cookies i want some now! Looks like someone is getting ready for Halloween! I love the ooey gooey melted combo of chocolate chips and butterscotch. It’s absolutely heavenly! I love oatmeal cookies that stay soft – these look perfect! I love how puffy and perfectly round your cookies turned out. And the suggestion of crumbling them on top of ice cream… perfect! I love chocolate chip oatmeal cookies – next time I am going to try adding the butterscotch chips. Oh my…these cookies… they look like absolute perfection!! What a great choice for the SRC this month. I would like to inhale a warm, gooey plate of these right now! These cookies look completely irresistible! Great pick! 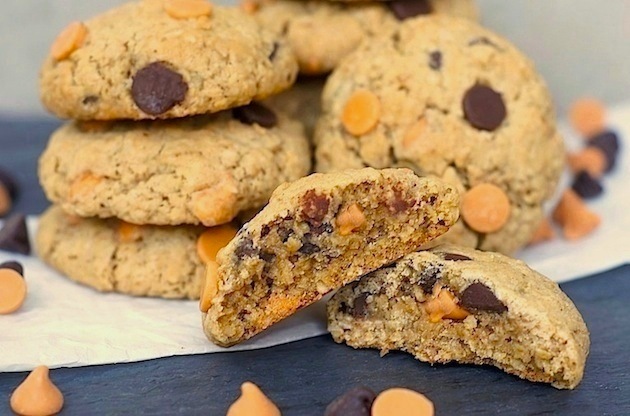 I looooove chocolate chip oatmeal cookies but never thought to add butterscotch chips to them! Your photos are so so gorgeous, too…yum! wow. these look so simple and delicious! (and I really do love recipes like that) And I think we should just start adding chocolate to everything. I’m sure it wouldn’t hurt in, say, fried chicken or spaghetti! ha. I love the idea of a secret recipe club. I’d love to join something like that one day! Ya buddy!! You know I’m all about oatmeal cookies and these look like a perfect fall treat. These cookies look thick and perfect! Girl, you need to stop posting so many delicious looking cookie recipes!! You’re killing me with these pictures!!! I was just thinking today that I haven’t made chocolate chip cookies in probably over a year! Chocolate & butterscotch is such a good combination! And I love the addition of cinnamon. Sounds too good to be true. Amy, you’re a doll! Thank you for your sweet words about K&K Test Kitchen! I’m so glad that you liked these cookies, especially after going through every recipe. And I’m thankful for SRC too for giving us the chance to virtually meet! Yum! I love butterscotch. I can’t wait to give these a try. Butterscotch! I love love love love butterscotch. I have some butterscotch chips that I brought with me from the US but I can’t bake with them. I have to enjoy them in their purest form. But one day I’ll be able to bake with butterscotch again! And when that day comes, it will be glorious. These look amazing! I love that you included a picture of the inside. More people need to do that! Chocolate and butterscotch are such a great flavor combination! These look super tasty! There you go putting all these great things in one cookie. I have had oatmeal scotchies and oatmeal chocolate chip but not a combination. Looks so tasty! OMG, I am in over whelm! All these wonderful flavors in one cookie, I gotta have one! I made these tonight with my kids and they are absolutely delicious! Thanks for the recipe!! !